In 2006 the world economy was booming, partly on the back of triple-A investment innovations. Then, suddenly, the boom ended. What fascinates the authors is the fact that almost no one saw the 2008 economic crisis coming. 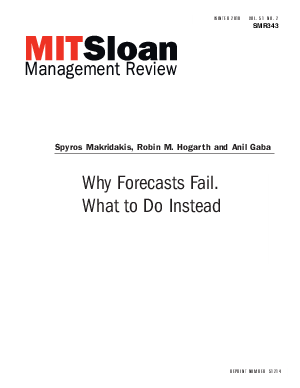 In this article, the authors come to terms with the reality that, in economics and business, accurate forecasts aren't possible. Therefore, they say, managers need to develop a different attitude about the future. The key is not to develop precise plans based on predictions but to have emergency plans for a variety of possibilities. The main thing is to stop believing your predictions about the future and to develop plans that are sensitive to surprises, whether they are future credit crunches or other unexpected events. The authors acknowledge that forecasters have produced excellent work over the years -both practical and academic. But forecasting models are not set up to cope with what they call the "big hairy coconuts"-the unexpected occurrences that are a fact of life in the real world of business. To compensate, they propose what they call "the three A's": Accept, assess and augment. First, managers have to accept that they're operating in an uncertain world; second, they need to assess their level of uncertainty; and third, they need to augment the range of uncertainty to compensate for risk.